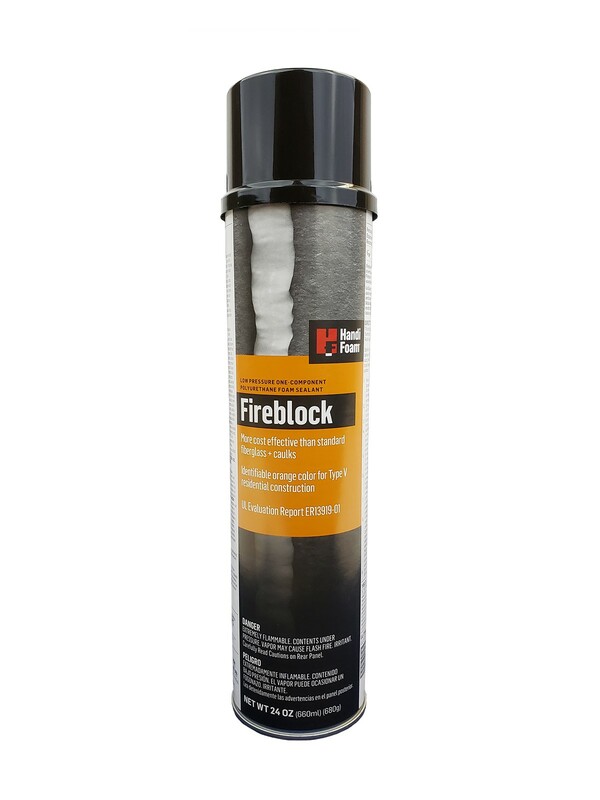 Handi-Foam® Fireblock low pressure, one-component, polyurethane foam sealant is a moisture cured sealant designed to seal, fill, bond and stop air infiltration in areas where a fireblock product is required. Handi-Foam Fireblock has a recognizable orange color allowing inspectors to easily identify the use of an approved fireblock product for Type V residential construction. Due to its expansion characteristics, Handi-Foam Fireblock is more effective than many traditional fireblocking materials for the blocking of flames and smoke in concealed penetrations, preventing flame spread from room to room and floor to floor. Handi-Foam Fireblock is UL GREENGUARD Gold certified contributing to healthier indoor environments. The International Building Code mandates that polyurethane spray foam be separated from the interior of the building by a 15-minute thermal barrier or other approved covering. DC315 passed certified NFPA 286 and UL 1715 by ETL over a variety of open and closed cell spray-applied urethane foams. It complies with all the requirements of 2006 IBC Section 803.2.1; 2009 IBC Section 803.1.2 and Section 2603.9; 2012 IBC Section 803.1.2 and Section 2603.10 "Special Approvals for Thermal Barriers over Foam Plastics". DC315 also meets the requirement as an Ignition Barrier per AC 377, Appendix X at an incredible spread rate of 400 sq. ft. per gallon.